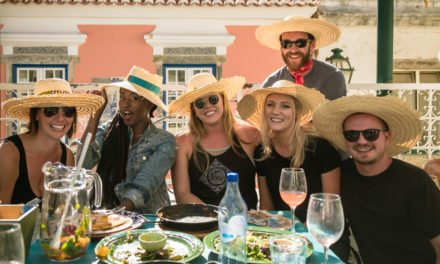 Traveling the world has its share of chaos in many forms. 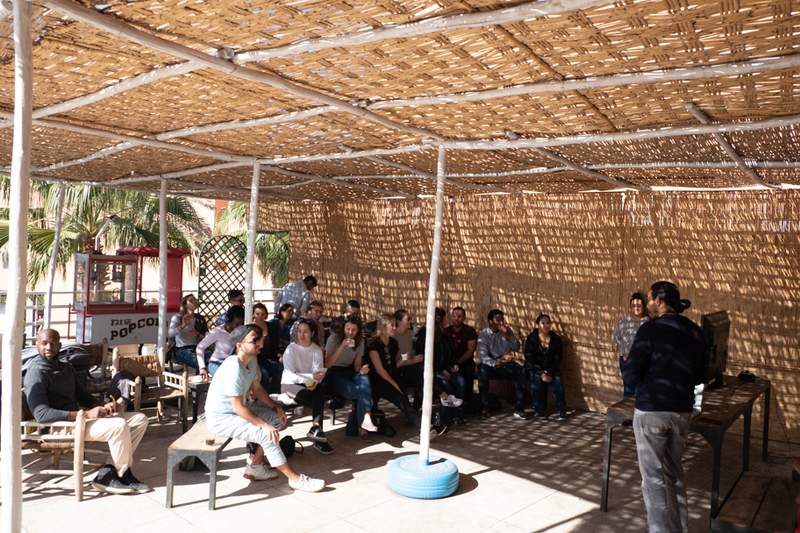 On that note, Taha, the Operations Manager for the Remote Year Marrakech City Team, advised our #RYCurie group to embrace the chaos of his home city. Not surprisingly, the experiences within that chaos make for great subject matter—the ultimate canvas for me as a food & travel photographer. 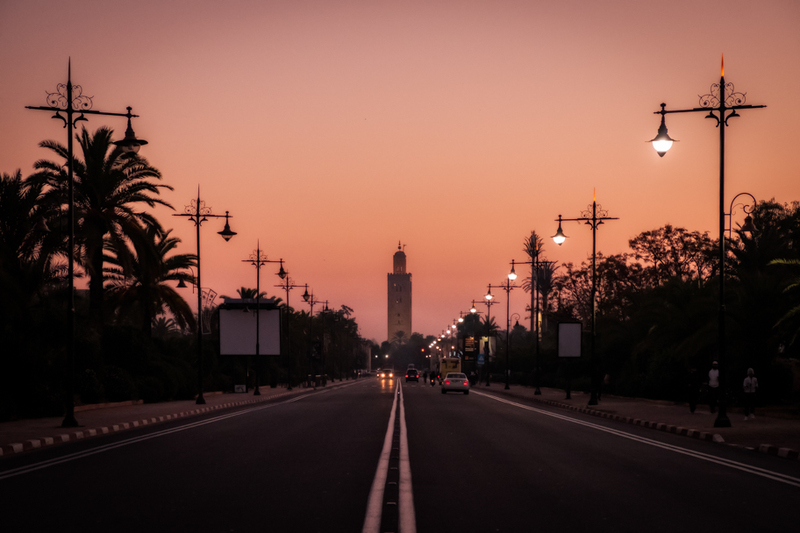 Marrakech, Morocco marked the first continent change on our #RYCurie itinerary. Fortunately, the thrill of a new country and temporary home for a month served as a good sort of chaos. Anything worth doing good takes a little chaos. 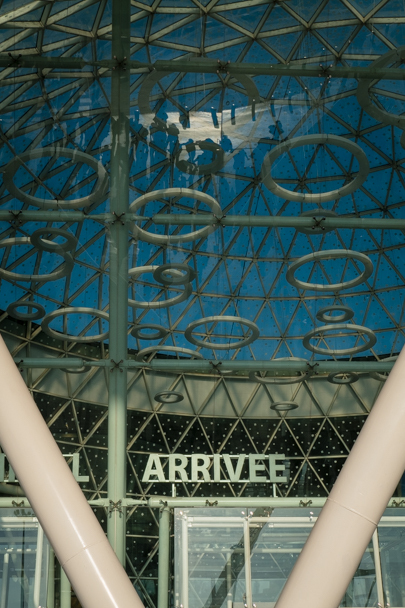 Upon arrival at the Marrakech airport, our excitement about transitioning to another continent was palpable. North Africa’s sunshine, deserts and red-clay buildings contrasted greatly to Prague’s white winter and metropolitan architecture. 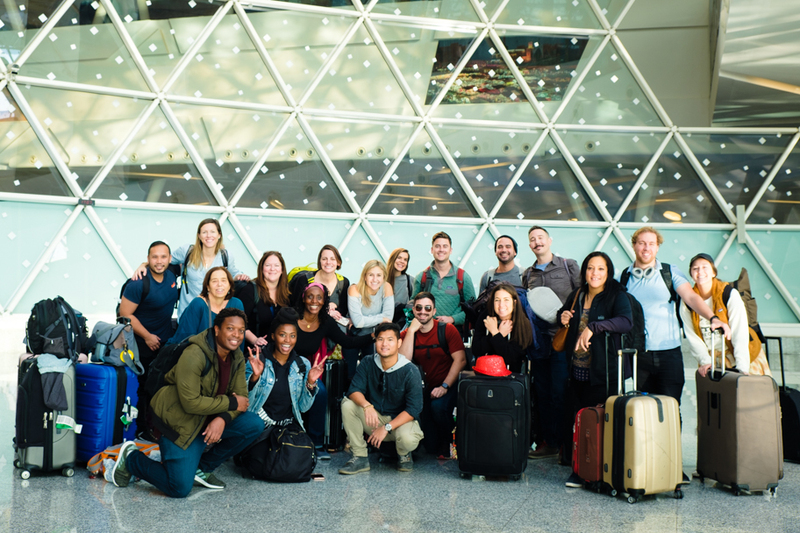 Remote Year Curie arrives in Marrakech airport full of excitement about calling a new continent home for the next month. Blue skies seen through the whimsical ceiling art were a treat for this travel photographer. The famous Koutoubia Mosque dominates the Marrakech skyline. It was built in the 12th century and stands 77 metres high. As the primary mosque in Marrakech, the misplacement of Koutoubia Mosque during its original construction was a big deal, enough so it got built a second time. The original mosque had to be corrected for being off center and not aligned with Mecca. The early-morning Muslim call to prayer rings out from Koutoubia’s minaret and is echoed by all the other mosques in Marrakech. Koutoubia Mosque is the largest mosque in Marrakech. 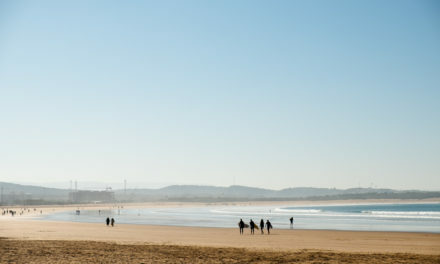 One of the benefits of traveling with Remote Year is getting a city orientation when we arrive at each new city. At the coworking space, the local team provides us with a comprehensive overview of the city’s culture and hot spots. It’s great to have the potential chaos of being in an unfamiliar culture eased by the knowledgeable local team. It’s so great to have access to a coworking office with outdoor working space. 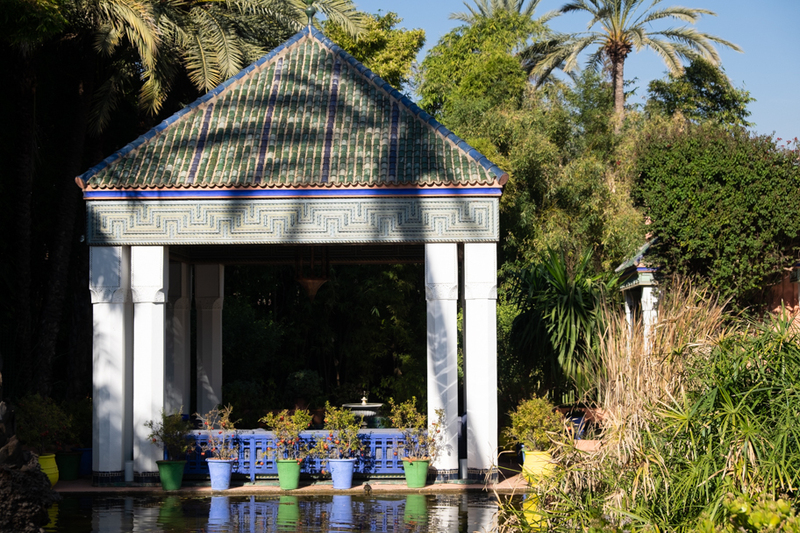 A vast palm grove that became an artist’s studio and garden, Jardin Majorelle was actually abandoned after its first owner, Jacques Majorelle, passed in 1962. Later in 1980, Yves Saint Laurent and Pierre Bergé acquired the grounds and restored them. Saint Laurent credited the gardens as inspirational, and seeing a selection of his original creations at the YSL Museum totally changed my perception about high fashion—for the better. 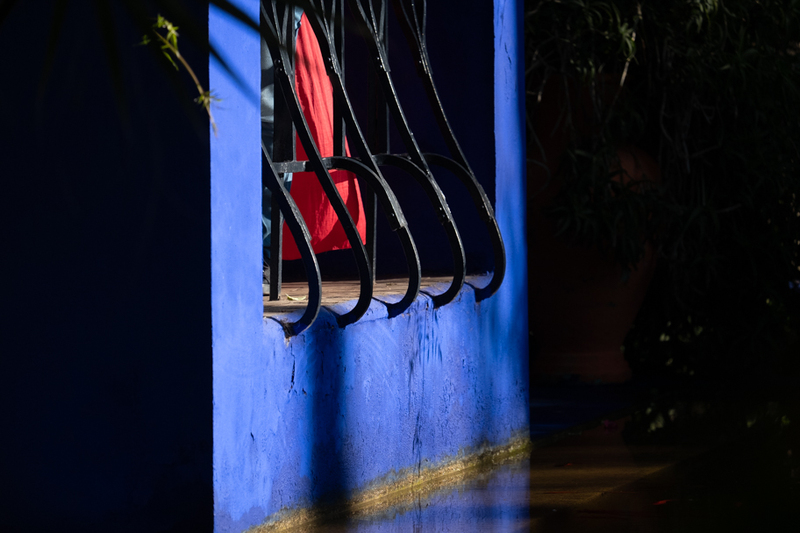 Today, a memorial for the fashion designer graces the garden which is maintained by The Foundation Jardin Majorelle. Within the grounds a Berber Museum also welcomes guests to ooh and awe over the ancient tools, jewelry and clothing of the indigenous North African people. Part of Yves Saint Laurent’s villa. 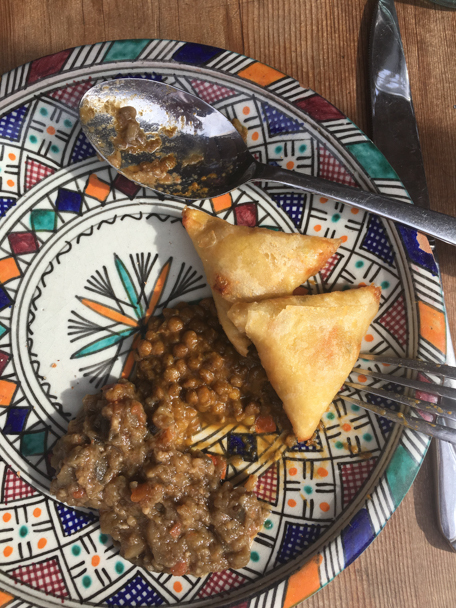 Tagine is a traditional dish of Morocco that I loved on my first try. It’s just like a stew and is served with fresh bread. Dipping the bread into the stew to soak up the juices is delicious! Depending on the protein within, you might enjoy it with prunes, apricots, preserved lemons or olives. So much flavor. 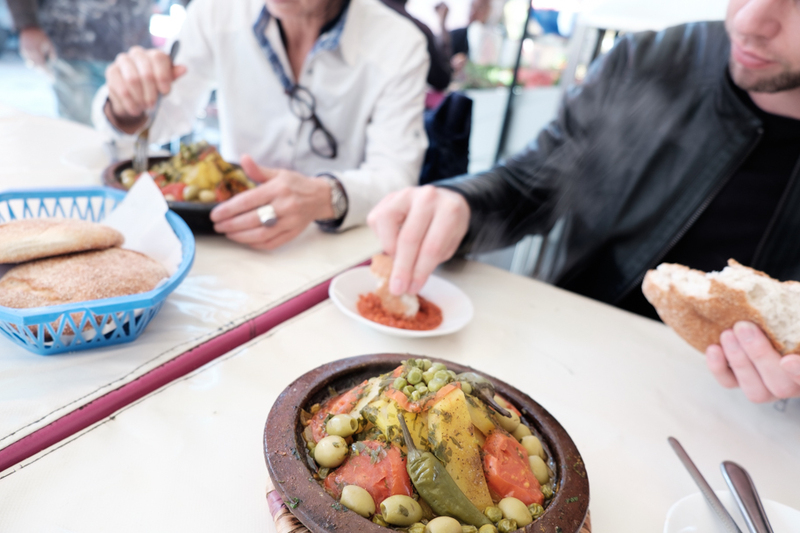 Enjoying beef tagine with friends at a rustic streetside restaurant in Marrakech, Morocco. 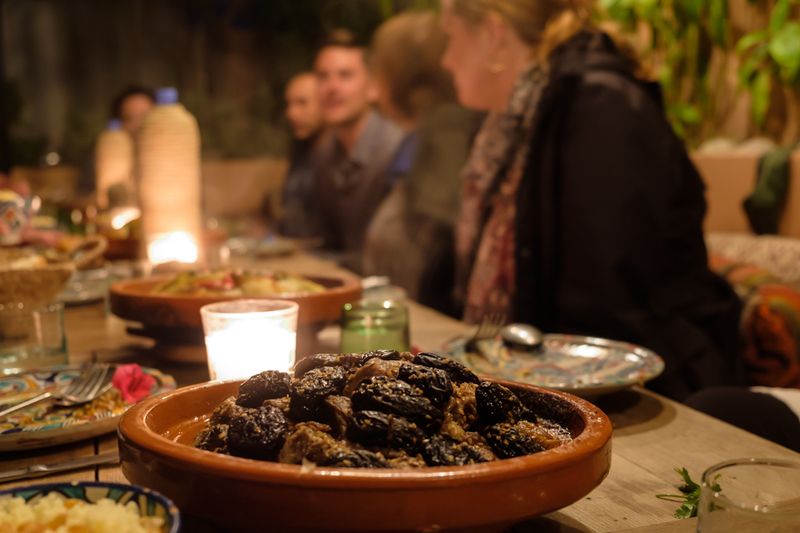 Lamb tagine with prunes is a popular dish in Marrakech, Morocco. Celebrating New Year’s Eve in Marrakech needed to be something out of the norm, so a few of the #RYCurie folks organized a party to end all parties! 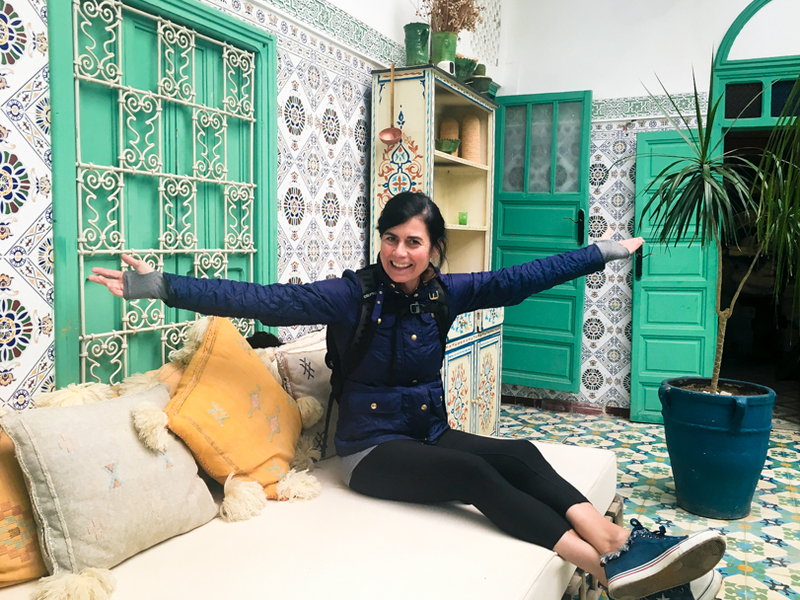 We rented a 16-room Riad outside of the city, enjoyed an amazing sit-down dinner prepared by some local chefs and cooks, danced to a DJ who spun tunes for hours, and also learned a few moves from a belly dancer. And, some of our crew decided to create a music video too! It was all a ton of crazy fun, and will stay intact as a memory for many years to come! Marrakech is called “the red city” because all the buildings are made with red clay. 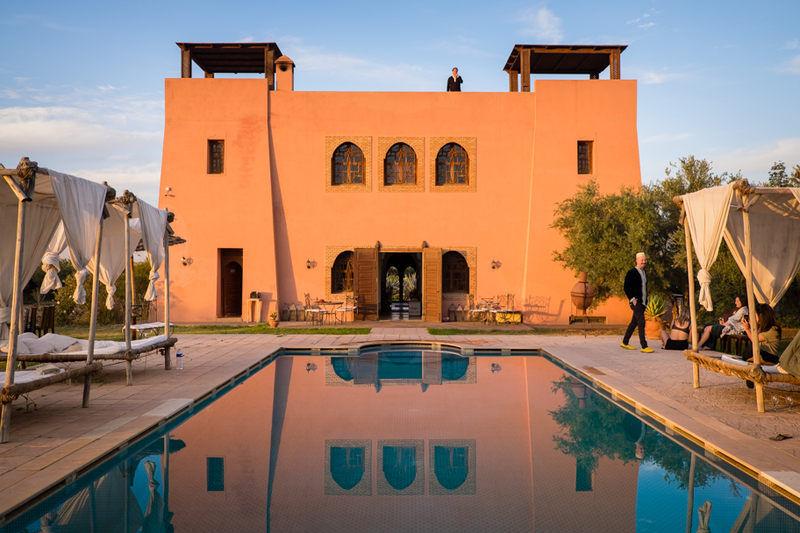 This is the Riad we rented for our New Year’s Eve party. 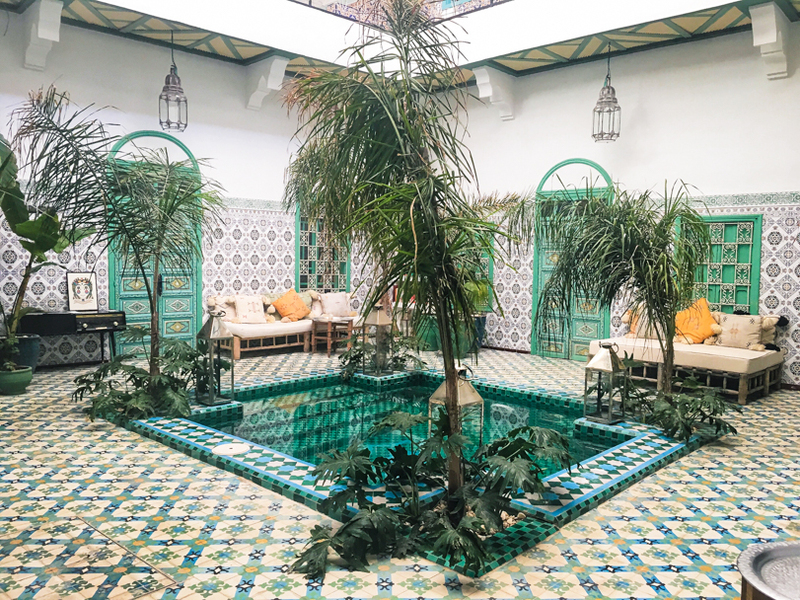 To retreat from the hustle and bustle of the new sights and parties, I was treated by my friend Lily to a lovely spa in the heart of the Medina. 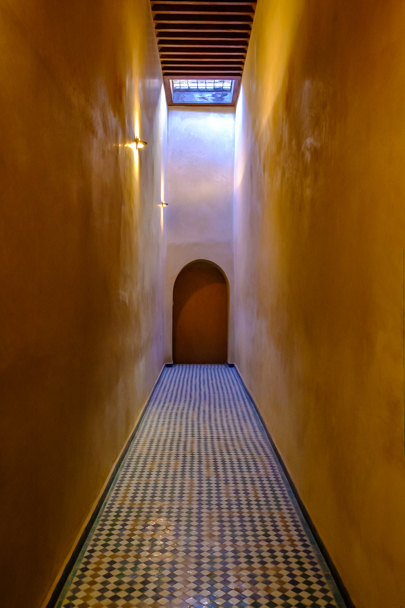 When you walk across the threshold of the Riad BE Marrakech, you transcend the chaos of the old town. You are immediately enveloped in a bubble of calm, peace, and beauty. In fact, “riad” means “a little piece of paradise”, according to Taha. I got a traditional “hammam” service which is a thorough body cleansing and exfoliation, plus a hair wash. My hair has never felt better! Then you get a massage and get to choose from a “relaxation” or “strong” massage. (I chose strong.) Topping it all off, tagine lunch was served on the upper terrace where we were bathed in sunshine. To say the least, I was in HEAVEN! The amount of pampering I enjoyed at the spa erased all of the chaos of the previous few days. Such a great way to start a new year! This is the main courtyard that you enter into when you walk across the threshold of Riad BE Marrakech, away from the chaos of the Medina just outside the door. Moroccan history and culture is a vast treasure-trove of depth and complexity. The Heritage Tour was an opportunity to skim the surface by visiting some monuments, palaces and mosques with Omar, a licensed city guide. I’m sharing mostly architectural photos here because everything is just so massive, beautiful, detailed and gasp-worthy! And oh-so-colourful, just like Marrakech itself. 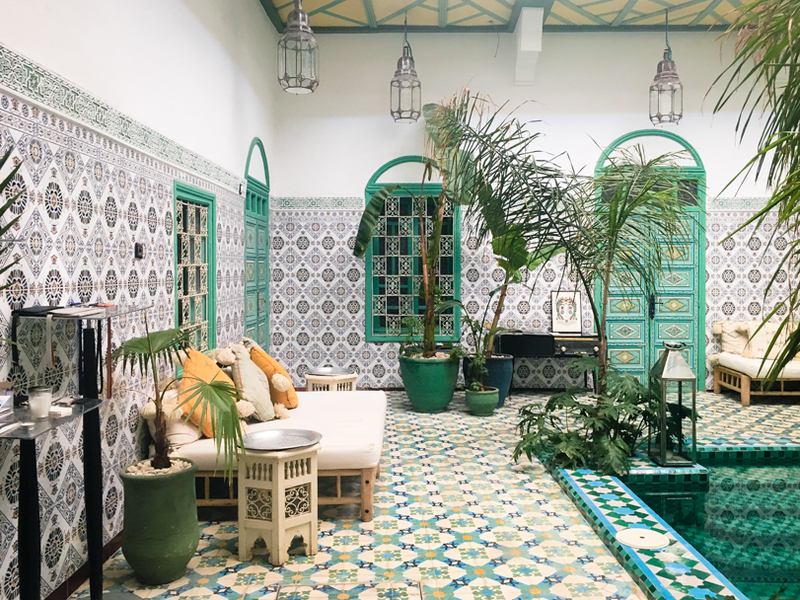 Just like stepping over the threshold of Riad BE Marrakech, entering the Prime Minister’s Palace, the Palais De La Bahia, from the labyrinth of the Medina is like walking into a piece of paradise. 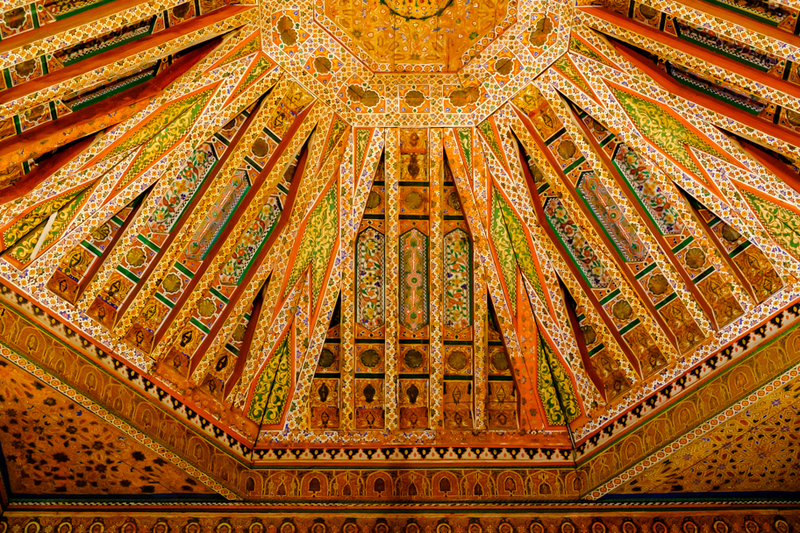 This is a small portion of a ceiling in one of the rooms in the palace. Just look at the detail and colour! It’s hard to give you a sense of the scale, but I suspect the ceiling was about 30-40 feet above us. Photos do not do it any justice. 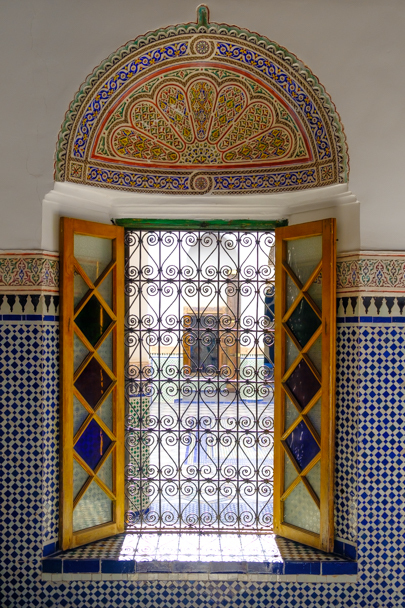 An outdoor walkway flanking the main interior courtyard of Palais De La Bahia. Servants were not allowed to enter the “noble” wife’s accommodations directly, so they had to walk down this corridor, outside to an alley, and then in on the other side. In ancient history, Morocco had the largest Jewish community in the Muslim world. Apparently there are fewer than 2,500 Jewish people in Morocco now, but the traces of their community and culture are evident. 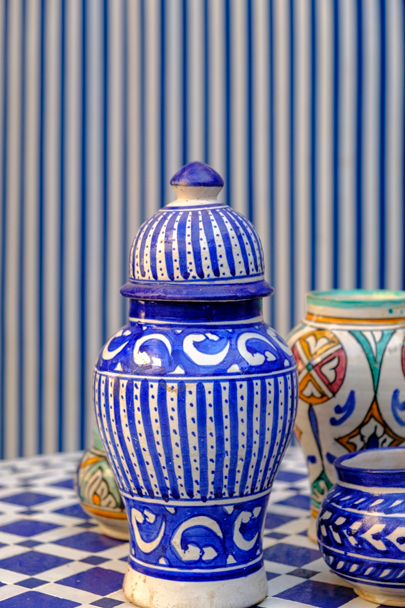 We visited the Slat El-Azama Synagogue in Marrakech’s medina and marveled at the vibrant blue everywhere, which is very much a symbolic Jewish colour. A couple of still life photos that portray the bright white & blue motif of the Slat El-Azama Synagogue in Marrakech. Our final stop on the Heritage Tour was at the National Museum of Weaving and Carpets and yes, there were some amazing artistic carpets on display. But I was also captivated by the architectural details within the space. 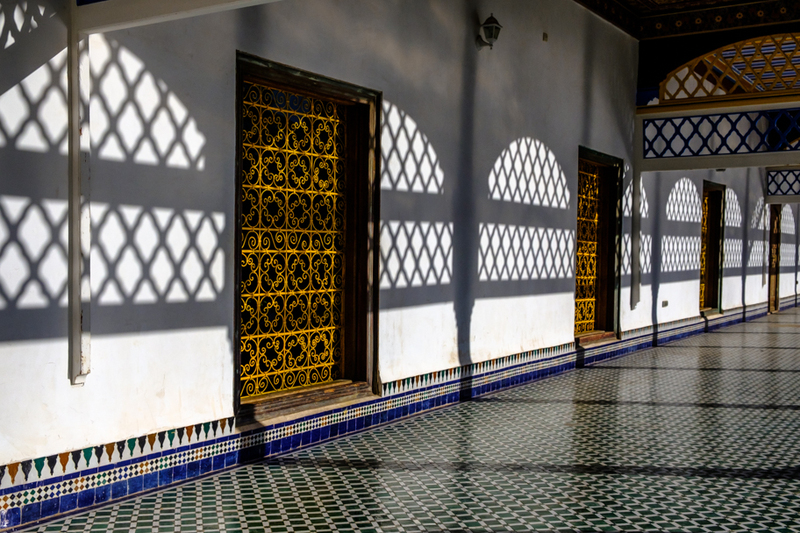 There’s something about the light that comes into the courtyards of the buildings in the Medina… it’s so soft and diffused and it’s a dream situation for a photographer. The Medina is the city’s old town and has been in existence since the 11th century. It truly is chaos until you step inside of a Riad or palace. Shooting photographs is a challenge because most locals despise getting their photo taken unless you pay them. 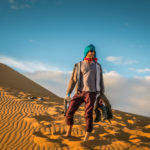 So I spent a lot of time “shooting from the hip” and have a ton of bad shots, and a handful of good ones! Also, the negotiating game for prices is expected. To play the game well you have to stand your ground, be firm about your price. You can’t feel intimidated and you have to be confident you are not offending the vendors with a low-ball offer. The more dedicated you are to the sale and the more dramatic your denial of their offers are, the more success you will have. It’s best if you walk away… then they will usually follow you and meet your offer finally. It’s amusing at first, but can feel tedious after a few plays, until you realize it’s just a game so just play it! Another thing to expect in the Media are pickpockets! My friend watched a fellow reach right into my (empty) coat pocket and then pretend to apologize for bumping into me. “Pardon, Madame!” he offered as sincerely as he could while I looked him defiantly right in the eyes. The old town square has been used as a marketplace for centuries. Although it can feel like a tourist trap, it wasn’t always that way. 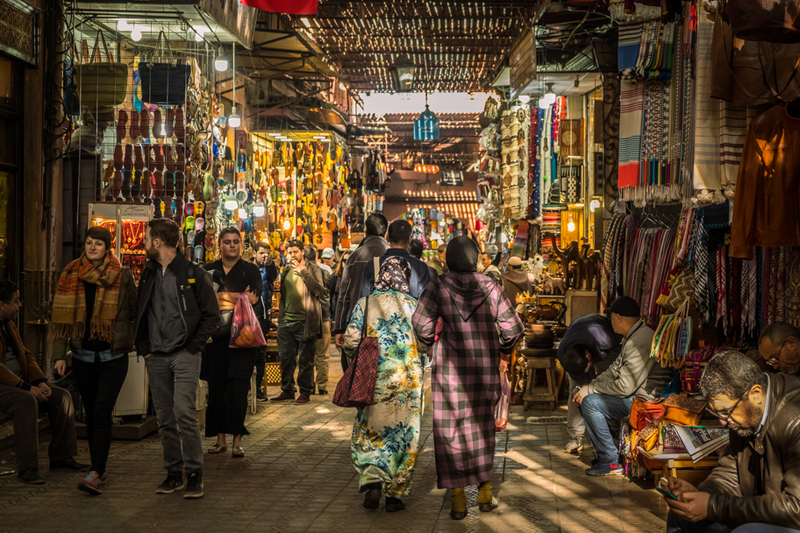 If you get beyond the first souks, and into the heart of the Medina, the true live marketplace is there for the thousands of people who live and work there. A typical scene in the Marrakech Medina, a chaotic jumble of souks, wares, vendors, locals, tourists, scooters, donkeys, bicycles, and more sights and smells than you can ever describe. 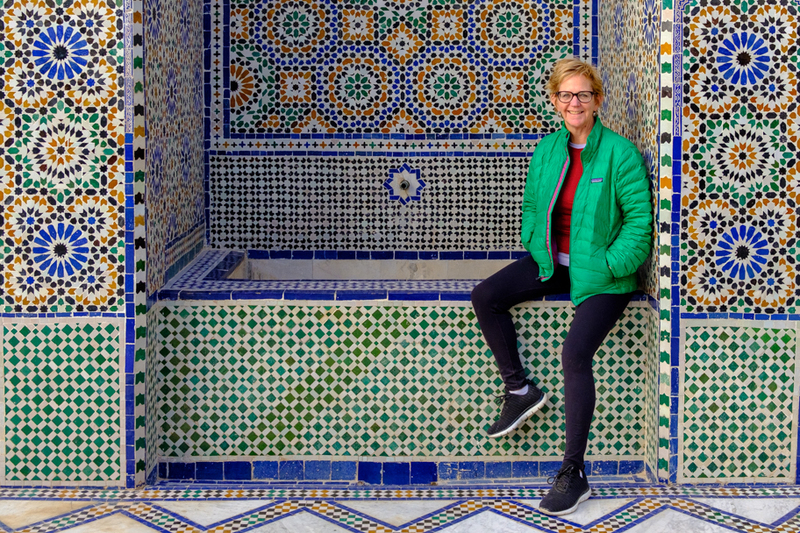 Our first week in Marrakech may have been chaotic but it gave me a better understanding how it is such a colourful and vibrant hub of the North African experience. When you embrace the chaos, you find only rich experiences to photograph and appreciate. Much more to come from Marrakech, stay tuned! 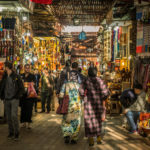 I hope you will share your comments about these Marrakech #travelphotos! Drop me a message in the comments below. I love your detailed stories Barb. 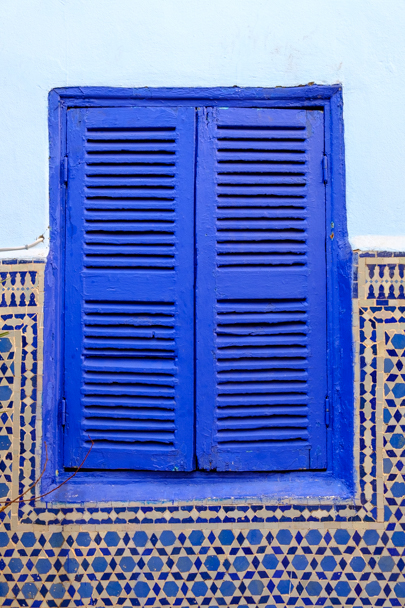 The colors of Marrakech are beautiful and invigorating. It’s definitely a location on my photography bucket list. I was at a Souk in Jordan which by your description would have been as chaotic as the one in Marrakech. 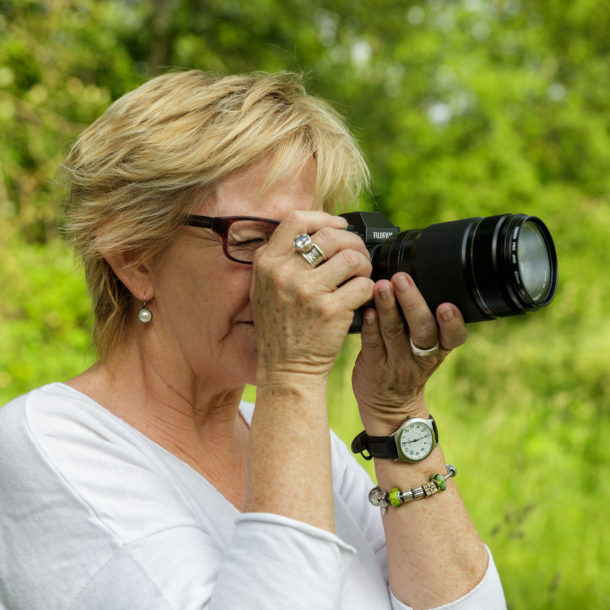 Thanks Janet, I really enjoy writing the stories to enhance the photos! 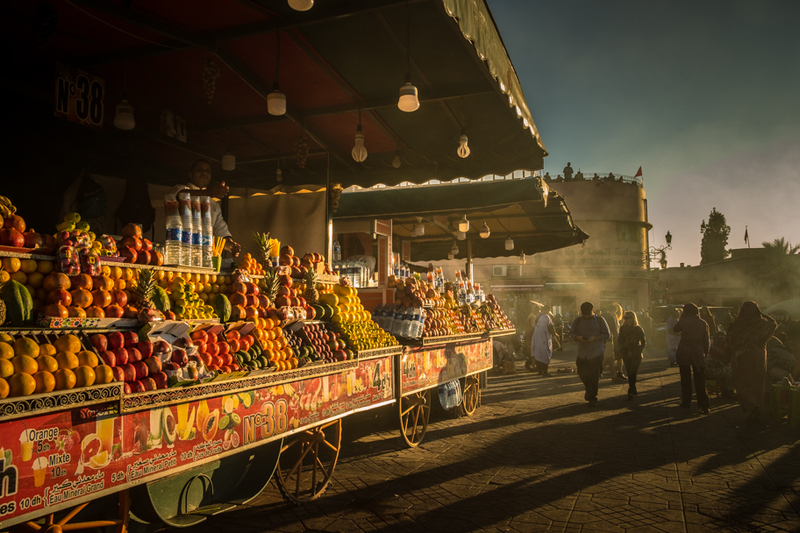 You would LOVE Marrakech, the sights/sounds/colours — it definitely is a place you want to get to. (I would go back with you!!). It looks like you are having a great time and I am enjoying the photos. Enjoy Morocco! 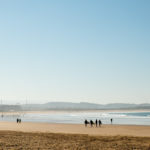 Wonderful blog and love all your photos. A very different experience than Prague or Europe in general. I hope when you return you can do a talk and slideshow for LCC. You are so right, Morocco was a complete 180 from Europe! But it was good practice for Hanoi… I would absolutely love to do a talk and slideshow when I return. Might need 6 hours though!!! LOL You can’t imagine how many photos I’ve captured so far. Wow. Wow. Wow! Gobsmacked. It made my day to see you in one of the photos. Love and miss you. And thrilled to see your adventure unfolding. Thanks my friend! LOL, yes, I am usually behind the lens so it’s tough to get photos of me. Snuck this one in 🙂 Miss you too! Barb the photos are awesome. The depth of colour and the use of so many vibrant colours in the pictures is so beautiful. Love it. Speechless. Colour are so vibrant and rich. Great to see you in a photo. Beautiful shots Barb! Definitely makes me want to go there. Plus your story telling brings them to life. So enjoying following your adventure. Thank you so much Denise! You really must go, it’s a photographer’s dream location… although it’s tough to take photos, but when they work out it’s magical.